This morning’s Gallup poll — the first of Republican primary voters since Mitch Daniels and Mike Huckabee announced they wouldn’t run for president — is getting a lot of attention for the seemingly strong standing of Sarah Palin, who polls at 15 percent amid signals that she may enter the race. But what I found more newsworthy is the strong performance of Herman Cain, the entrepreneur and talk-show host who was included in Gallup’s poll for the first time. He polls at 8 percent, ahead of candidates like Tim Pawlenty, Michele Bachmann and Jon Huntsman, who have received far more attention. It’s just one poll, of course, in a campaign that has barely begun to take shape. Mr. Cain’s standing was somewhat lower, at 4 percent, in last week’s Suffolk poll, which still included Mr. Daniels but not Mr. Huckabee. And candidates like these — who begin with small but very enthusiastic bases of support — can sometimes foil pollsters who take a quick-and-dirty approach to polling and do not collect a sufficiently random sample, instead hearing from only the most passionate and tuned-in respondents. 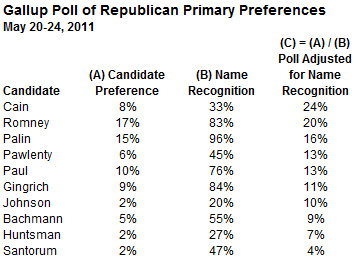 Still, this measure — a candidate’s polling adjusted for name recognition — has a reasonably good track record. It would have identified winners like Michael Dukakis and John Kerry relatively early in the process, as well as Bill Clinton by the time he officially entered the race in November 1991. Mr. Cain has other disadvantages — the major one being that he’s only run for office once before, in the G.O.P. Senate primary in Georgia in 2004, which could significantly increase the risk of gaffes. He’s unlikely to win much support from establishment Republicans in Washington — although he’s very popular with grassroots blogs like RedState. Mr. Cain, also, is African-American, which could have various kinds of tangible and intangible effects. I would not suggest that Mr. Cain is one of the leaders. But in a field where the three insider favorites to win the race — Mitt Romney, Tim Pawlenty, and Jon Huntsman — collectively poll at just 25 percent, and where some Republicans seem to be pining for an outsider (perhaps even outside-the-box) choice, he’s the freshest face. Although his credentials as an elected official are obviously nonexistent, that also means he has less baggage to run from. Mr. Cain seems to be taking his bid seriously, unlike (for instance) Donald Trump. Polls like these ought to ensure that he gets at least a fair amount of media attention, assuming the press is doing its job properly. He has good chance of having some influence on the race — perhaps like Mike Huckabee in 2008, a candidate with whom he shares some similarities. And I don’t think the possibility that he could actually win the nomination can so easily be dismissed. The argument that you’re likely to hear elsewhere is that candidates without an electoral track record haven’t won the nomination in the modern (post-1972) primary era. But it’s a small sample size, and some or another precedent is broken in nearly every election cycle. An earlier version of this article incorrectly stated that Mr. Cain had never run for office before. In fact, he ran for the Republican nomination for the Senate in Georgia in 2004, but lost to Johnny Isakson.